A humorous murder mystery perhaps (I know that’s a little oxymoron, but can’t help it) with lots of twists and turns, investigation and two detectives who are police officers. With politics involved, that can lead to trouble too for the duo. It promises to be an interesting tale that combines two of my favorite things to watch on television, cricket and crime shows. It was quite accidentally that I landed up on the home page of Penguin Metro Reads. I wasn’t exactly looking for this book but when I saw the title and the quite simple cover design staring back at me, I got interested. It was like the book was calling out for me to buy it. Needless to say, I did. I think this is the first time I’ve seen the sides of a book colored red, and though that would go well with the murder mystery theme, I felt it was an overkill that needn’t have been done. The story begins with the vivid detailing of the death of Mr. SN Rao, who is the minister for sports and a cricket board member. It is a richly described prologue in my opinion, with the mental suffocation of the victim being brought across exceptionally well. The interest of the commissioner to make sure the high profile death isn’t having any foul play associated with it lands the case in the lap of the deputy commissioner Ravi and the assistant commissioner Rahul. In true investigative style, and with a will to complete investigations completely and quickly, the duo gets to work with chasing the trail, finding clues and hints given by the victim and unearthed with the steps they take. The duo appears to be on the same wavelength which aids the investigation. They also take the load off each other when three more cases surface during the case, and they have to find out if it is related to theirs. It is a page-turner, not very pacy but not deadpan slow either. The narration is good, keeps you engrossed but I could find a couple of typos. However, it was nothing so serious that it affected the read. Rahul is as adept at finding clues and links as his senior Ravi is, and Geeta Sundar puts this to Ravi’s credit and mentorship. It bodes well for a fan of crime fiction. I liked it. Though many secondary characters surface as is expected in a mystery, I find it wonderful that she keeps the detectives as the cynosure throughout the book. To me, three specific parts are there to a mystery novel. The victim: Her fondness for cricket brings about this victim, a power figure and hence a must cause for a more in-depth investigation. So it makes sense. The other victims, as they surface, do not make immediate sense, but they are all connected in the end. The detectives: The DCP-ACP duo was well chosen. They play their strategy and thoughts on the case off each other, and work together very cohesively. Simple character sketching, but it works well. The motive: I can’t say what it was, it’ll give it away, but it works. I felt so, and it made sense too. 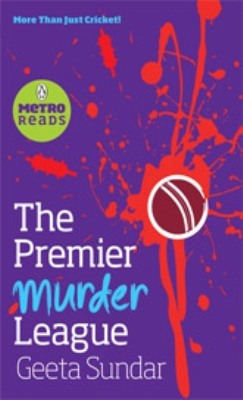 Anyone who follows T20 cricket will relate to this book, which I feel is a catch for both crime fiction lovers and cricket lovers. If anything I felt detracts, it was the overemphasis on the cohesion of the detectives, with the same being mentioned expressively in two or three places in the narration. When the reader can visualize that well enough, I find it unnecessary to point it out specifically. Oh yes, and the red colored sides as well. Linked with: First Reads Challenge at b00k r3vi3ws blog. Your review definitely makes the book sound credible and I'd give it a shot but with some reserves about the cricket part! And the cover is interesting, and stands out as compared to most Indian books I see these days with their childish(or excessively Indian-flavoured) illustrations. adding to wishlist. this sure sounds like a good read. I like your review style mate. @Nimue: It is a good read :) Yes. I felt so.